Eight ways the BlackBerry Torch is a copycatResearch in Motion launched its new BlackBerry 9800 Torch at a New York event with much fanfare, dubbing it the “best BlackBerry ever.” But many commentators have pointed out the latest offering from the Waterloo, Ont.-based smartphone maker isn’t exactly innovative. It seems to have borrowed ideas that have helped other successful phone companies steal away market share over the last couple of years. 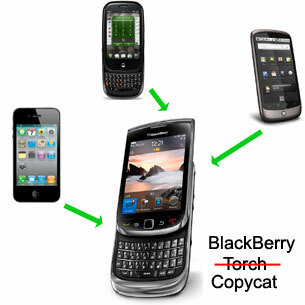 The Torch is very different from the BlackBerrys of the past, but its very similar to several other popular smartphones on the market (namely one that starts with a lowercase “i”). Capacitive touch screenThis isn’t the first BlackBerry to have a touch screen, but it is the first capacitive touch screen. The Storm and the Storm 2 have “transmissive” touch screens. But it’s the capacitive touch screen first used by Apple’s iPhone that many feel react best to human touch. It works by sensing the electrical properties in a fingertip — meaning it’s not compatible with a stylus or through a glove. 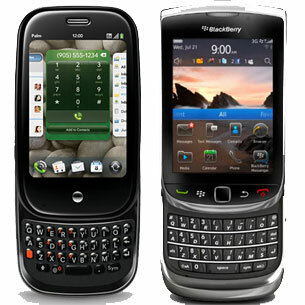 BlackBerry also includes a software keyboard in the Torch, similar to the iPhone’s approach since it was unveiled in 2007. Gone is the SurePress technology that turned the Storm’s screen into one big button the user had to press down for each character entered. 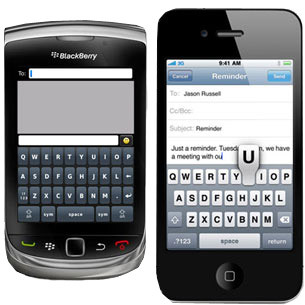 Most smartphones with a QWERTY slider keyboard have it pop out from the side of the device, giving the keys a landscape orientation. But the Torch has a keyboard that pops out underneath the screen, giving it a portrait orientation that is more in line with its previous designs, such as the Curve and Bold. But BlackBerry isn’t the first to feature this type of keyboard. Palm’s Pre phone also featured this design. Although the phone hasn’t become successful for a long list of reasons, it did receive high praise for its hardware design. Searching for information on a mobile device is often the best way to quickly locate something. Whether it’s a contact, a saved note, or an article on the Web, quickly typing in a search term can save time rather than sorting through folders and menus. So it’s no surprise BlackBerry has included a “Universal Search” feature in BlackBerry 6 OS. It scans folders, apps, emails, and the Internet for any search term. The iPhone has supported this same feature for years. Swiping to the right from the main home screen revealed Search, and typing in a few key words quickly returns results for contacts, messages, calendar items, and Web results. Other smartphones have since added similar features. Webkit browserCopied from: iPhone, Android, Palm Pre, etc. WebKit is an open source Web browser development platform that is gaining in popularity. It is most notably used by Google’s Chrome browser and Apple’s Safari browser. But it is especially popular for use on mobile operating systems such as iOS, Symbian, Android and Web OS. Poor Web browsing capabilities is a common gripe amongst BlackBerry users and some say the most important problem RIM had to address with BlackBerry 6 OS. 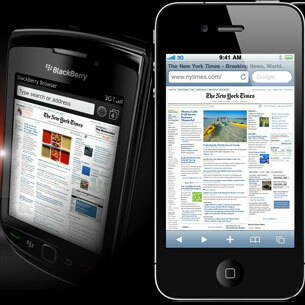 WebKit should do that, as it offers a mobile Web browsing experience that is similar to using a desktop computer. 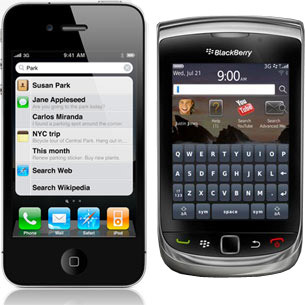 Between Facebook, Twitter, LinkedIn, and BlackBerry Messenger (BBM), there are a lot of social applications where you can receive messages on a BlackBerry device. It seems natural then to introduce the Social Feeds feature in BlackBerry 6 OS. 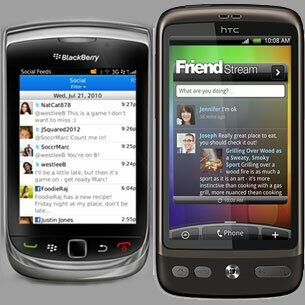 The new application will group messages from Facebook, Twitter and BBM. Manufacturers using Google’s Android OS have recently done the same thing with similar built-in features. Motorola made its MotoBlur feature the selling point of three smartphones launched earlier this year, and HTC introduced Friend Stream with the Desire. BlackBerry doesn’t try to hide the fact its looking at Apple’s success when it comes to constructing its own media features. 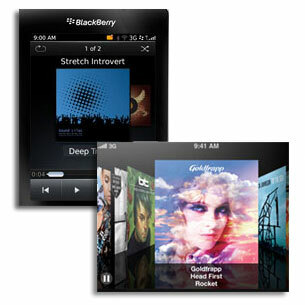 BlackBerry Media Sync is meant to interface with Apple’s iTunes software and load its playlists onto BlackBerry devices. The application also syncs with Windows Media Player music, and photos and videos. Now BlackBerry will even scrape the album art information from iTunes and display that along with the tunes a user is playing. In other words, now it will also look like the iPhone’s music player in addition to using its backend software for organization. Along with a capacitive multi-point touch screen comes the ability to select strings of text using fingertips. This is done by the user tapping the area around the text as best they can with two fingers, then adjusting sliders on the end of the selection area to get the exact text needed. The execution of this feature on the Torch is done exactly the same way on the iPhone. Selecting text using a touch screen can be difficult, as precision is important for this process. 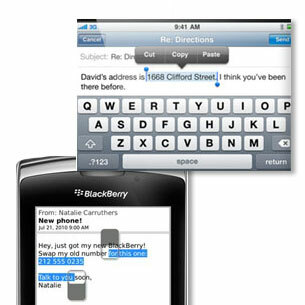 BlackBerry users may find themselves highlighting text with the trackpad still, despite the new feature. Oddly, photos and videos of a baboon are seen in some of the marketing for the BlackBerry Torch and in some parts of the online demo for the device. It might seem like a strange choice, but BlackBerry isnít the only firm in the mobile business to use primates for marketing purposes. 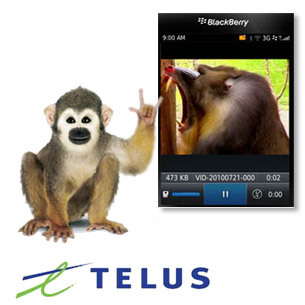 Telus Mobility is known for its cute animal-based marketing campaigns and recently had a monkey starring in its ad images.